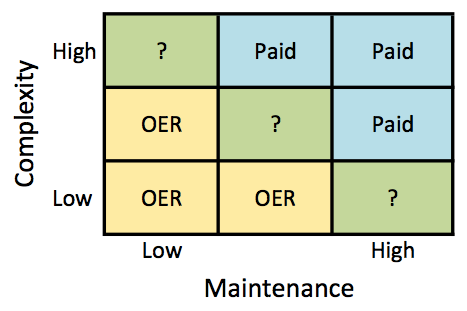 Open Educational Resources (OER) are here to stay. Publishing, despite the rumors, is not dead. The real question is not “if” but “how” these two options will co-exist in the instructional materials market. The range of materials teachers draw on to support their work in the classroom is vast. At the low end there are simple black and white worksheets or practice learning tools (e.g. flash cards). These tools are simple enough that a single person, or a small handful of folk, can quickly make them. Quality is important, but in this regard accuracy is valued more than design. Distribution is typically on paper or PDF. Requirements for efficacy studies are low or non-existent. At the high end there are resources like video games where the act of creation involves coordinating large teams with diverse skills. The complexity requires professionals who specialize in a range of crafts (project management, coding, game design, illustration, audio engineering, user testing, interface design, efficacy research, rights management, etc etc etc). In the quality arena both accuracy and design have to meet high standards for the product to be usable. Distribution requires explanation (sales), professional development, and a student progress monitoring platform. Educators demand large scale efficacy studies and clear evidence of alignment to standards. As more materials move to on-line distribution we are shifting to a world where instructional resources live in an ecosystem outside of the classroom. Paper based products and digital worksheets stand on their own once they are purchased. These products don’t need any ongoing maintenance other than some duct tape and spell checking. But as more and more resources move to the web they live in a complex ecosystem that is both technological and cultural. On the tech side web platforms have to be constantly updated to protect against security gaps, file formats evolve with new releases, operating system updates create new bugs in software, and hardware platforms are evolving rapidly towards touch interfaces and new screen resolutions. On the cultural side standards get updated, new linkable content is constantly being created, and best practices change as new research is released. For for most web based products ongoing maintenance is not optional. Without it products can be rendered useless overnight by the decisions of outside actors. Sustainability in a world of impermanence is value added. Applying these two filters provides some guidelines for where OER makes the most sense and where schools should be looking to professionally produced content. For publishers there will always be a market for simple worksheet like products, saving teachers time in a busy world has value. But this will be a business of low margins and intense competition. Publishers would be better served by focusing on more complex products where complex teams add value and where ongoing maintenance is not optional. Innovation, quality, and support will be the new vectors of competition replacing distribution networks, operational efficiency, and process refinement. To compete globally a publisher has to do all of those things, but the relative emphasis is shifting. Are you?